For every new regulation, two must be cut. President Donald Trump campaigned against federal overregulation. And on Monday, he fulfilled his promise. 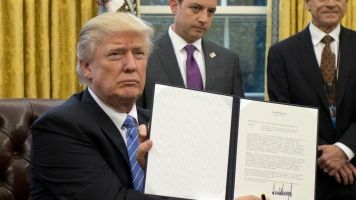 According to a new executive order, agencies looking to introduce a new rule will have to cut two existing regulations. But the old rules don't have to be eliminated the same time the new regulation is issued. President Trump argues that too many federal regulations are overwhelming small businesses. He signed the executive order after meeting with small-business leaders. Trump's mandate also requires the net cost of adding one regulation and eliminating two others to be zero. Regulations related to the military, national security and foreign affairs are exempt from this new rule.